Why just knit? Laurel Hill products can help create an ambiance of creativity, confidence and peace to enhance your knitting experience. With our knitting needles in your hands you can feel the weight and smoothness, hear the sound of the needles when the points touch, and enjoy the satisfaction of completing a challenging project. That’s what it’s all about. All our products are created from sustainably harvest native woods in Vietnam and handcrafted. We’re committed to supporting our suppliers in Vietnam and have been recognized by the Vietnam Chamber of Commerce for outstanding business practices. Laurel Hill is a proud member of the The National NeedleArts Association and greatly respects retail yarn stores that educate the public about the hand knitting industry. We exhibit twice a year at TNNA tradeshows to learn more about the special needs of knitters & crocheters. Also, with feedback from the attendee’s and experts who attend the TNNA, we have developed a unique thumb rest for our crochet hooks that sets us apart from our competition. 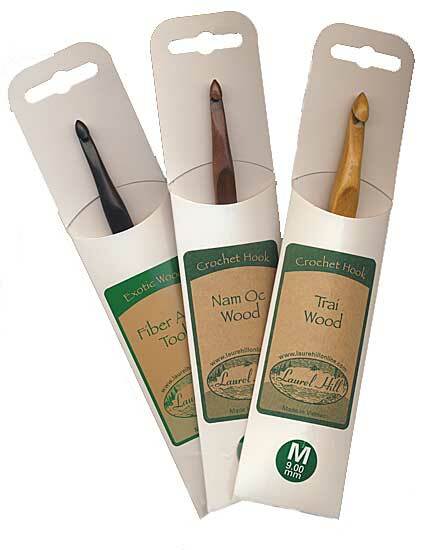 We’re sure you’ll love our knitting needles and crochet hooks. Hi-I’m wondering how I can see information about the hooks and needles you make. Is there a link somewhere on this blog that I’ve missed? Thanks so much.